Distance covered so far – 1900 km, GMT +1, -5 C, cloudy. Well that was quite interesting. 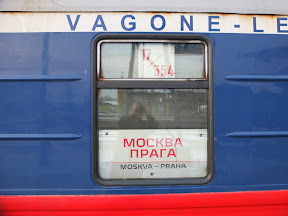 The Amsterdam train was two hours late into Warsaw but they had held the Moscow train for our arrival. I didn’t see them switch any carriages but they might have done – Amsterdam to Minsk & Basel to Moscow carriages both travel this route. My carriage attendant, who was doing a first class job with little English, gave me a voucher – apparently PKP actually financially compensate passengers when they are this late. It’ll never catch on in the United Kingdom! 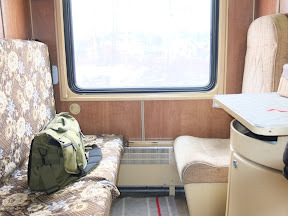 When I got to the new train (on the very next platform) my heart sank a bit as I had apparently drawn the short straw – carriage 354 has not yet been restored like the others on this train, so has the shabby chic look and feel inside of a cold war submarine. Anyway, its not all about the latest rolling stock. On arrival on board I met my first Provodnitsa of the trip – pretty casually dressed and very helpful, despite the fact we don’t have a word in common. I think she’s keeping an eye on me in case I get led astray by the other Russians on board! A bizarre thing happened next. 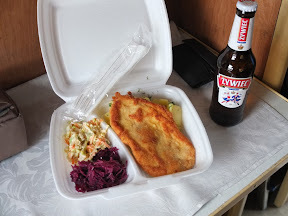 The really friendly waiter from the EN447 (which terminated in Warsaw) got on board my new train and served me pork schnitzel, potatoes and sauerkraut together with a bottle of local beer. How’s that for service and enterprise? The set up on this train is quite different and so is the atmosphere. I had heard about the dress code – shorts and flip flops would be on the smart end of the scale in first class. I haven’t visited third class on this train, so I don’t know what they choose to wear (if anything). 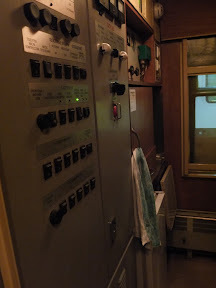 A lot of people leave the compartment doors open, play music and seem quite social in my carriage. It’s actually a nice feel and just what I had hoped for. But I do have to say that it feels inherently wrong wearing a pair of shorts when outside it’s well below freezing. I must remember to change before getting off! 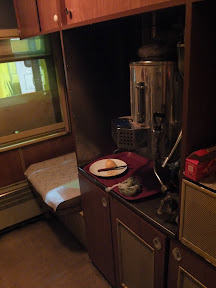 There is no restaurant car on this train, but vitally the Provodnitsa’s compartment has a samovar providing an endless supply of boiling water. In keeping with the submarine feel she also seems to have a lot of buttons and communications stuff.. maybe an Enigma machine too?! There seem to be at least three officials at work in my carriage. I hear them mention my UK passport from time to time, so I hope I’m not going to be singled out for special treatment at the border with Belarus. I went for a look at the far end of the carriage, and we have a small snow drift inside the outer part of car. It’s really dry and powdery and seems to get in anywhere there is a gap. No wonder the windows are sealed shut. 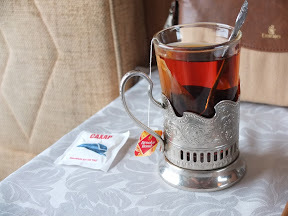 I’ve got my feet up right now and the Provodnitsa has just served me tea – quite in keeping with the “Hunt For Red October” feel here in my Captain’s cabin!